Original Trade Idea: Another Shot At Shorting EUR/USD! You know what they say about meeting the right person at the wrong time? 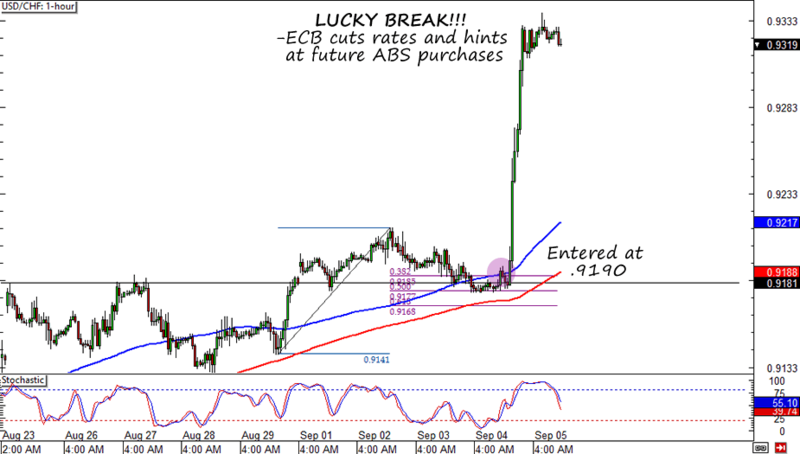 Well, that’s kinda like what happened with this EUR/USD setup! As I mentioned in my original trade idea, the pair’s fundamental landscape hasn’t changed. EUR is still plagued by weak reports and geopolitical concerns while the dollar is making pips rain with strong reports from the US. In my original idea I mentioned that I’ll be watching for potential retracement opportunities. And lo and behold, a sweet Fib play soon popped up! 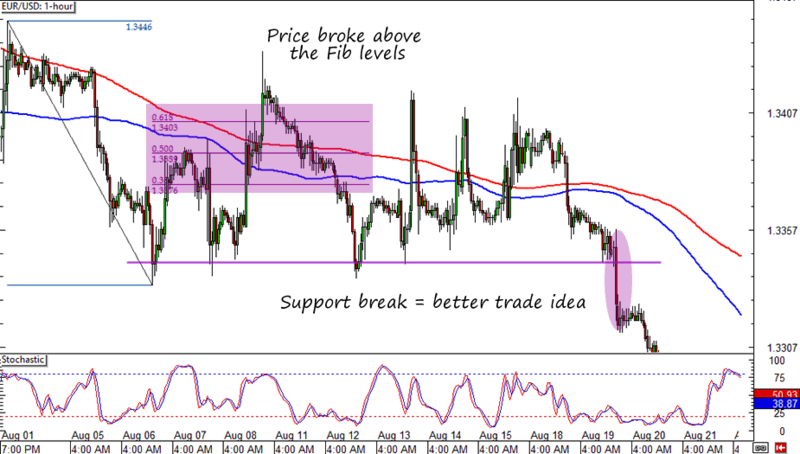 USD/CHF was stuck at the .9170 area during the Asian session, which wasn’t surprising given that it was near a 50% Fib, 100 SMA, and previous resistance levels on the 1-hour chart. It also helped that I was optimistic that the US reports scheduled yesterday would exceed market expectations. I decided to pull the trigger right around the start of the London session after the pair popped up a bit. I entered at market (.9190), and risked 0.25% of my account on trade with a 45-pip stop loss. I guess I got lucky on this trade! Not only did reports from the US come in better-than-expected, but the ECB also fired up the dollar after it unexpectedly cut its rates and hinted at more stimulus to come. 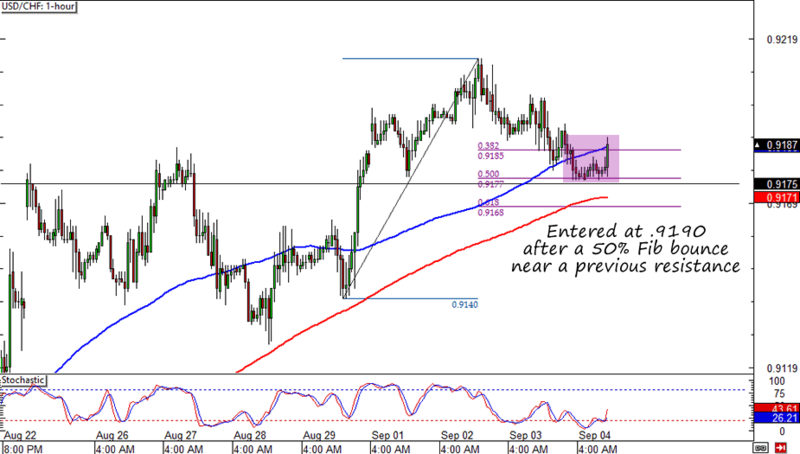 USD/CHF easily rocketed to the .9300 area, waaaaaay above what I had expected for a day trade. Right now the trade is up by 135 pips (+0.72%) with a trailing stop loss 45 pips behind. I’m keeping my trade open for the NFP release and consider adding to my position if the NFP report prints to the upside. How about you? What would you do in my position? Did you catch any of yesterday’s action? Let me know!